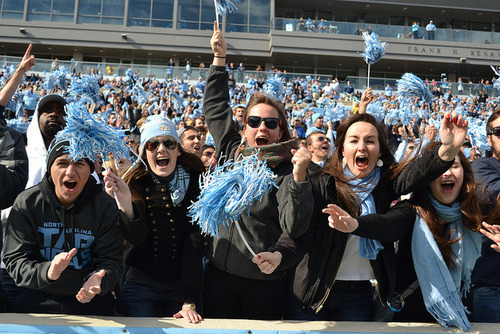 University of North Carolina, Chapel Hill Tar Heels fans at a football game. Credit: Elliott Rubin. Controversy in college sports isn’t unusual but usually fighting on the field makes the news. At University of North Carolina (UNC), Chapel Hill it’s the professors, boosters and fans who are throwing ‘bows and calling each other names. For years now there have been stories of student athletes who receive easy grades and take bogus classes. That’s a familiar accusation at most big sports colleges in America but then a critical study was produced that claimed to find evidence of favoritism and the term “Paper Classes” became a rallying cry. Former UNC employee Bradley Bethel says that the study and people who accepted its findings are all wrong. So last month he started a crowdfunding campaign to make a documentary to prove that the reputation of the prestigious university and its players are being dragged through the mud by pundits and the national media. 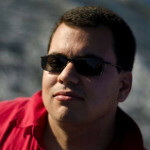 His campaign hit its $50,000 goal in one day and with a little over two days to go, the 30-day campaign has raised more than $120,000. Mary Willingham, a former academic advisor at UNC who tutored student athletes, describes an institution that protects and coddles unprepared college athletes by funneling them through independent study courses with the academic rigor of a middle school. About a year ago Bethel started taking small bites out of the prominent narrative of Willingham’s research from his blog Coaching the Mind. He contends that Willingham’s findings were collected unethically, contain erroneous conclusions and that the data was paired with unfairly hand-selected anecdotes. In short: student athletes were getting an unjust bad rap. 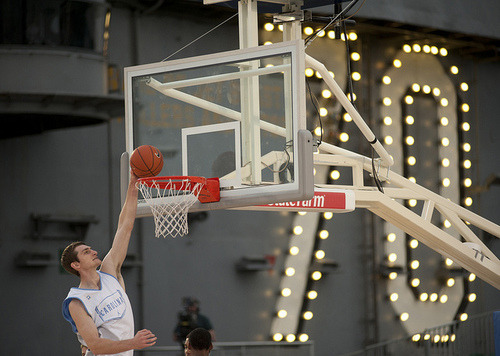 UNC player Tyler Zeller warms up at the Carrier Classic aboard USS Carl Vinson in 2011. Credit: U.S. Navy. To create the documentary, Bethel has assembled a talented group of professionals, including producer Connie Lo Ferrara, associate producer of a documentary that examines the media’s account of the Penn State sexual abuse scandal. In his blog, Bethel said his motivation behind the documentary goes all the way back to his childhood when he was hesitant to prevent the harassment of his friend from the neighborhood bully. 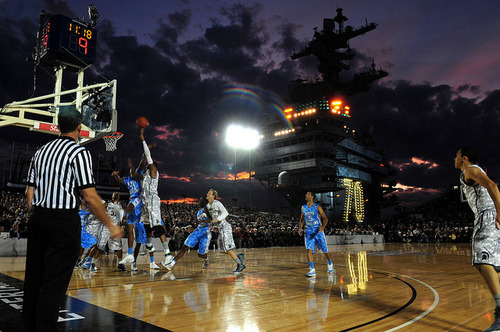 UNC Chapel Hill vs. Michigan State University at the Carrier Classic in San Diego in 2011. Credit: U.S. Navy. UNC professor Jay M. Smith joined forces with Willingham to create Paper Class Inc., an organization pushing educational reform by igniting a national conversation around literacy and athletics. Last year Smith called Bethel a “rabid attack dog” on the site Paper Classes Inc.
“He wants to protect…the collegiate model of sport whose virtues he has made part of his own identity, the very justification for his professional life,” Smith wrote on the website. Later this year Smith and Willingham will release the book Cheated: The UNC Scandal, the Education of Athletes, and the Future of Big-Time College Sports. Correction: The original version of this story stated that the 2011 Carrier Classic was played between UNC and University of Michigan when in fact the game played between UNC and Michigan State University. We regret the error.